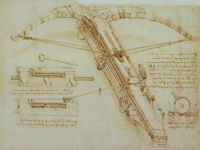 As well as inventing “instruments of war” Leonardo sought to improve existing weapons. This design is based on a traditional crossbow. There are minor improvements in terms of its design but the greatest innovation is its gigantic scale. Leonardo describes his crossbow as 42 braccia long, that is about 24 metres. The bow-arms are comprised of laminated sections lashed together for maximum flexibility. On the left are designs for alternative mechanisms to draw back the bow-string; above is a method involving striking a pin with a hammer and below, one that involves tripping a latch with a lever. The giant crossbow is based on the idea that the force of thrust is directly proportional to its scale, as proposed by Aristotle. Leonardo asks “whether if an arrow is shot from a crossbow four hundred braccia, a crossbow in the same proportions but of four times the forces and size will not send the arrow four times as far”. Later, having gained an increased awareness of the complexities of the issue through “experience”, Leonardo realised that the matter was infinitely more complicated than he had thought. If a force moves a body in a certain time over a certain distance, it is not necessary that this power move twice its weight in twice this time over twice the distance, because it might be that this force might not be sufficient to move the mobile object.